“Findability” of stored information was a criteria for the dropping knowledge Website, a site offering extensive multimedia content. Visual browsers, still under development, enable us to find information according to various usable factors like time, type, color, size, form, correlation etc. meaning more possibilities compared to finding in linear results such as search engines pages. A conventional search engine like Google can search for text strings, but does not deliver context related content or high level terms of the searched topics. 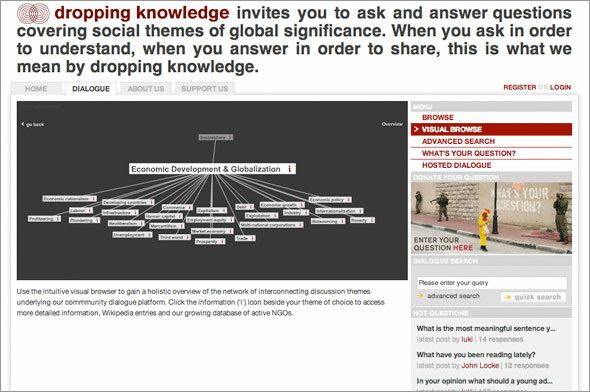 The dropping knowledge library used an ontology of social problems that covered almost all issues and their terminology. This ontology was extracted from a database of social problems compiled for approx. 20 years by the Union of International Associations. It contains 23000 issues, most of them too specific for the planned online library, but still representing an ideal base for thematic indexing of the library due to it’s rich terminology and structure. A visual browser was developed to easily access this richness. Founded in San Francisco in 2003 the goal of dropping knowledge is to catalyze global change. 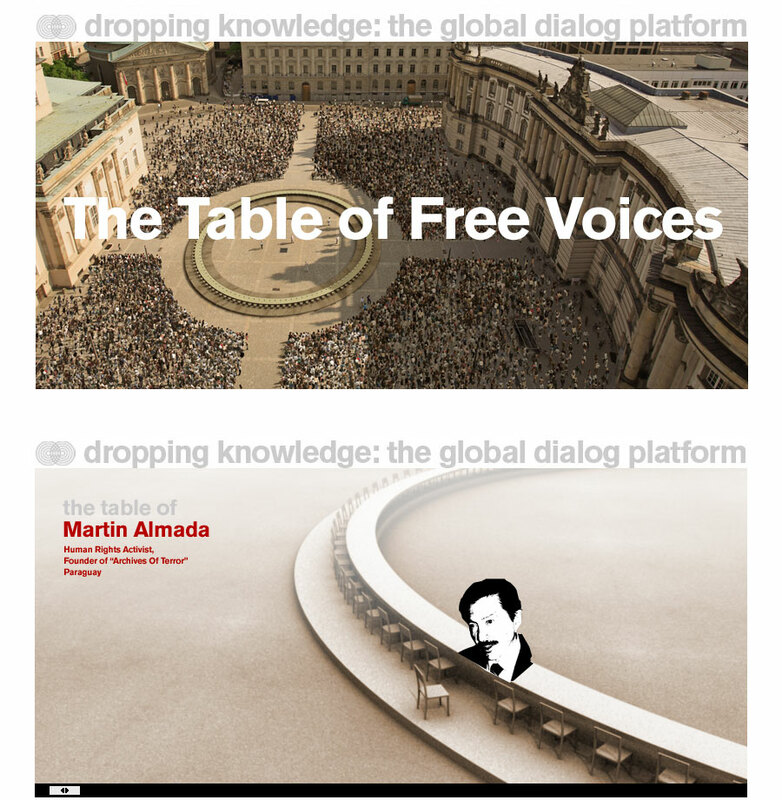 A sophisticated website initiates communication between NGOs, activists and participants from all over the world. The initiative peaked in September 2006 with the “Table of Free Voices”. 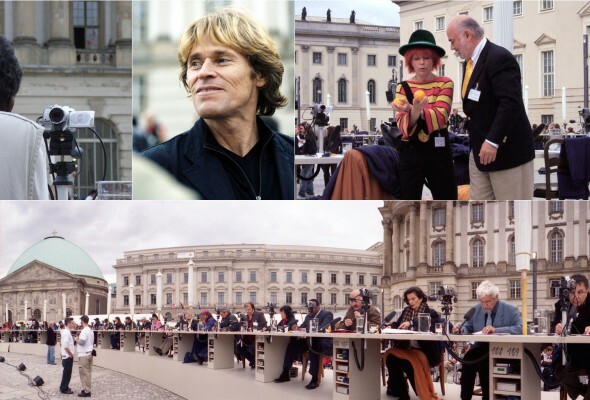 It brought together 112 well known people from culture, politics, science, art, music and literature from around the world on Berlin’s Bebelplatz. There they answered 100 selected questions on global life and society. All answers were video recorded, archived and made available to the public through the website. Thus, not only 100 perspectives on one question were available but also the 100 answers of one person to global issues – all in all 1000 hours of material. After the event dropping knowledge evolved into Mindpirates, „a sustainably not-for-profit ‘anti-agency’ out to hijack your imagination”. Impressions of the Table of Free Voices, panoramic photograph by Reiner Pfisterer.